Unfortunately, due to the ongoing repairs of No. 60163 "Tornado", it will not be visiting the Railway on the 25-29 May, 2018. However, the loco is being rescheduled to visit the Railway on 3-7 August. The Railway is finalising the details of the new visit now, and it will be announcing them shortly. All customers with bookings for the event in May will be contacted by our Customer Services Department as soon as possible. We are pleased to announce that Paddington™ will still be visiting us on the 28-29 May and that the Teddy Bears' picnics will still go ahead with one of our own locomotives heading the trains on 26, 28, and 29 May. This photo and the one below show the extent of earthworks as the last of the spoil heap is being removed at the south end of "Dingley Dell". After an extremely wet spring we have at last had a period of (mostly) dry weather that has dried out the ground and enabled Matt Crawford and his hard-working team to make significant progress on stabilising the embankment. The materials for the framework of the Heritage Skills Centre (HSC) have been on site since the erection of the main shed, but no progress has been possible until the ground in this area has been reduced to finished levels. With the work on the embankment progressing well, it is anticipated that excavation can start before the end of the month, with the spoil being used in the embankment works. Discussions are underway about starting the erection of the framework during June. Work not strictly part of OP4 is the relaying of the down yard. Plans are being prepared and components assembled for a new layout that will provide significant improvements in the yard's operational efficiency and also facilitate the shunting of stock into the new shed. No. 33: Pullman kitchen car "Constance"
This project is entirely funded by donations, and a further £150,000 is required to complete the brickwork and cladding of the northern and eastern wall, which will provide additional weather proofing for the carriages and provide extra security, screening the vehicles from the road. If you can support this much-needed project, please visit the " Cash for Cover " donation page. The event has been moved from November to mid-summer, and it will now be held on the evening of 30 June, 2018. Organisers are hoping that this will bring brighter, warmer, and drier weather. Also, instead of the whole line, the walk this year will start at Horsted Keynes at 6 p.m. and cover the five miles to Sheffield Park. Accommodation is being made for free transport of all walkers, by train, back to their original arrival point at the Railway. We are just seven weeks away from the Railway's annual Track Trek event, which this year takes place on the evening of 30 June, 2018. The Trek will offer a five-mile walk between Horsted Keynes and Sheffield Park. With the Railway's major fundraising appeal still being the Tr(ack) Action Appeal, all sponsorship money raised from this Trek will go towards purchasing more replacement track panels. The Trek will start from Horsted Keynes, with registration and safety briefings taking place between 5 p.m. and 6 p.m. The walk starts at 6 p.m. once a possession of the Sheffield Park-to-Horsted Keynes section of line has been taken. Trekkers can park their cars at Horsted Keynes to start the walk, or alternatively you can use the Railway's train service from East Grinstead or Sheffield Park to arrive at Horsted Keynes in time to start. From Sheffield Park, walkers will need to catch the 5:15 p.m. train and from East Grinstead, the 5 p.m. departure. 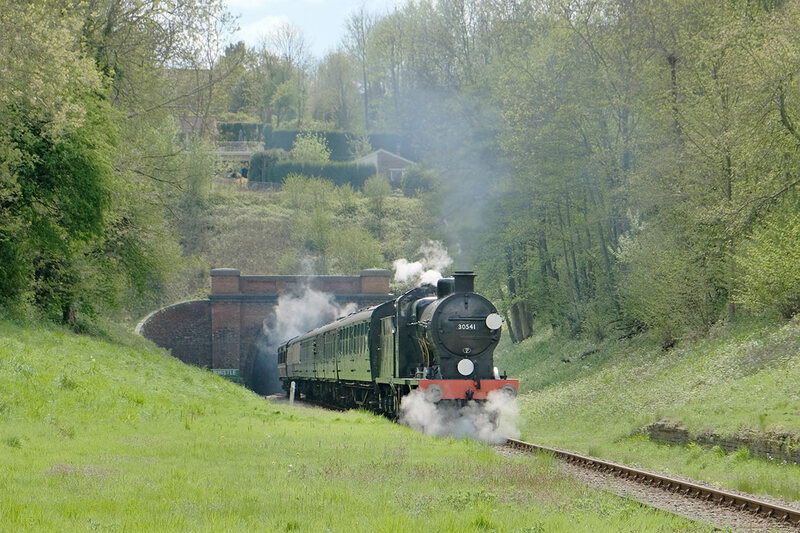 A special evening train after the Trek will take walkers back to Horsted Keynes and East Grinstead stations. Last year we had more than 200 people take part despite the damp conditions by the afternoon, so we hope lots of people will again take this opportunity to walk part of the line on, hopefully, a warm and dry summer's evening--and raise lots of sponsorship money for the Tr(ack) Action Appeal. The minimum expected sponsorship value is £20 per person and £35 for a couple or family (two adults and three children aged between 10 and 16 years). All trekkers will receive a certificate after completing the Trek. Trekkers who raise more than £100 in sponsorship will receive a commemorative medal. For more details and to download a sponsorship form, visit this webpage . If you wish, you can create your own fundraising page . The Track Trek team look forward to seeing you all in June! It is now seven years since the museum opened on Platform 2 at Sheffield Park station, and it's time to give an update since my last report in the Bluebell News magazine from Summer 2016. The original design of the Museum allowed for a viewing window into the carriage shed and a working signal operated from the Withyham signal box. Happily, these two projects have been completed in the past two years. Howard Strongitharm liaised with a local contractor to produce a very pleasing bay viewing window into the carriage shed. Under the leadership of Malcolm Johnson, Howard again found a contractor to make a suitable base for the signal post. Brian Hymas and members of the Signals & Telecommunication team, together with help from the Infrastructure team, moved the old starter signal from Platform 2, firstly to a place where it could be renovated and then in front of the Withyham signal box. A group from the Museum helped to restore the signal post, the fittings, and signal arm. Visitors can now enjoy the full signal box experience. A wall displayer has been set up to provide a space for displaying topical information, such as photographs and details of the Sulky Service. A series of photographs of the Railway then and now also appear there. A number of items have been acquired, mainly from auctions. Tony Hillman, our Assistant Curator, keeps a watchful eye on the main "railway-iana" sales. A large bridge plate from East Dulwich and a weight limit bridge diamond from Newhaven Harbour are amongst recent acquisitions now on display. Two of our stewards, Sue Elliott and Lance Hodgson, have developed a couple of quizzes for younger and older children, and these are being well received. Children receive a badge on completion of their quiz. We find that the children like being occupied and at the same time they are encouraged to seek out information that they might normally pass by. Currently, a complete redesign of the Museum website is underway. This redesign will produce a contemporary-looking website that is compatible with smartphones and tablets. More information will be available soon. Now that the ASH project is well under way, we hope to make progress on the long-overdue building of a Research and Records Centre at Sheffield Park. This centre will house the Railway Archive and the vast archive of material from railways throughout the south of England, the latter being held at considerable cost in storage off-site. We have been counting visitors over the past three years, and it is interesting to find that the numbers have been fairly constant, at around 45,000 per year. Before actually counting visitors, we estimated that the figure would between 8,000 and 10,000 per year, clearly a gross underestimate! The Museum is open from 10 a.m. until 4 p.m. when Service One operates, and until 5 p.m. for Service Two. Stewards are on hand to answer queries and demonstrate the signal box. Please do come and visit us! In other business, some readers who receive the eNewsletter via Gmail might notice that Gmail potentially flags the eNewsletter as possible spam. We have been informed by our third-party vendor Constant Contact that--despite their anti-spam filters--this happens because of the size of some of our newsletters. To avoid this issue, if possible, please verify the sender's email address and/or add the sender to your "white list". Introducing the S&T Data Recorder or "Black Box"
The curse of any engineer is to have a fault reported that rectifies itself before the reason can be identified or before a worse situation reappears. In the signalling world, this type of problem is known as a "self-rectified no cause found" (SRNCF), and when it is entered on the failure fault report, it is sure to generate a critical response from the management, particularly if delays have been experienced or if the issue reoccurs. It goes without saying that it can be very time consuming to look for a fault that isn't there or to wait for the problem to resurface. On the Railway, the Signalling & Telecommunications (S&T) Department faulting team are only routinely in attendance on Wednesdays and at weekends. To follow up a self-rectified failure that has not reoccurred for a number of days can be arguably a poor use of valuable time. Each incident is carefully considered, of course, safety is given the top priority, and the history of similar events is considered when informing a professional decision as to our response. To help us, last year the Railway acquired a Data Recorder (a "black box" that is in our case blue) that with the correct interface had the potential to help identify repetitive SRNCF faults. Unfortunately, when we received the box, we had little information on the device's features or how it could be linked with safety critical circuits. Not discouraged, Chris Chambers took on the challenge to understand the unit's attributes and design a safe method of connecting it to a variety of circuits. The successful result is a unit that can be fitted to any system and left to monitor exactly what is happening 24hrs a day; it can also be interrogated online from our office computer. Since we commissioned the new Kingscote signal box more than two years ago, and under very specific conditions, we have had a repeated fault reported to us. There was obviously an underlying issue in this case, but despite many days of investigation, we could not prove our suspicions of what was happening. With this ongoing issue in mind, we decided to fit and apply the Data Recorder. Within one week the problem re-appeared and our hunches were confirmed. As a result of the data, we are about to install an extra indication so that signalmen can feel confident that the locking is performing as it should and there is not a fault. We are very lucky that the cost of the material for the Data Recorder was sponsored by the members of the Signalling Records Society who visited us last year. We thank them for their generosity. Despite being very busy in the Dingley Dell next to OP4, now that we have fine weather, the Infrastructure Team always makes time to help others with "just in time" jobs when they arise. A conversation with the Signals and Telecommunications (S&T) Department about an upcoming job in November led to an order for a new signal to replace No. 28, the second advanced up starter at Horsted Keynes. There is nothing wrong with No. 28, but during the engineering possession in November, when the track is being realigned and moved over 300mm, the signal will be in the wrong place and fouling the structure gauge . In the short time span available in November, getting the old signal out of the ground and moving it a short distance without disturbing the ground too much will be a bit of a problem, so it has been decided that making a new post is a more practical option. The new post can then be planted before the old post is removed, probably by being gas cut off at the base. With a lot of bullhead rail being available after the recent track works, it was a fairly easy task to choose a couple of clean sections do the job, emulating the method Southern Railway used in the old days with their scrap. The last signal post we made for the down elevated running shunt signal at Kingscote was made in a day, in what we thought was record time. This new post-- which is even twice the length (or height)--was constructed in just five hours. Rails were cut to length and wire brushed, holes marked out and drilled, and tube spacers cut and then fully assembled with original Southern bolts. The post was delivered by road railer to S&T the following day and was painted just three days later. All that remains now is for the various electrical and mechanical bits and pieces to be attached while it is helpfully on the ground, and then it can be delivered to the site when required. A reminder that the Bluebell Railway Preservation Society AGM will be held on 19 May, 2018, at the Burgess Hill Academy, Station Road, Burgess Hill RH15 9EA, commencing at 7pm. It promises to be a fun-packed weekend later this month showcasing the Railway's small-but-powerful locomotives! A busy timetable is planned over 18-20 May, 2018, recreating the branch line feel of the Railway in its heyday, with nos. 263, 323, 30541, and 65 in service, plus special visitor Great Western Railway Saddle Tank Loco No. 813 (pictured), courtesy of the GWR Preservation Fund & Severn Valley Railway (Holdings) PLC. 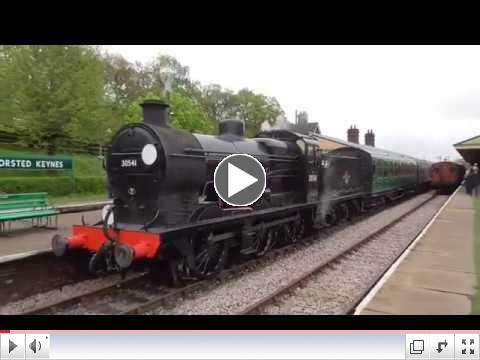 On Friday the Railway will operate an increased frequency timetable between East Grinstead and Sheffield Park, featuring shorter trains hauled by the smaller locos and No. 813. On both Saturday and Sunday, it will be case of "All Change at Horsted Keynes", with a packed timetable of trains between there and both Sheffield Park and East Grinstead, with frequent changes of locomotives. There will be plenty of opportunities to "hop on and off" at different stations and watch the locos as they shunt at Horsted Keynes to accommodate the mixed timetable. There will be a different timetable on each day, so why not make it a long weekend and sample our variety of locos, coaches, and stations. Brake van rides also will be available. Purchase tickets and find out more here . Heritage Painting has completed an excellent paint job on BR Standard No. 75027, in preparation for static display in the new museum. 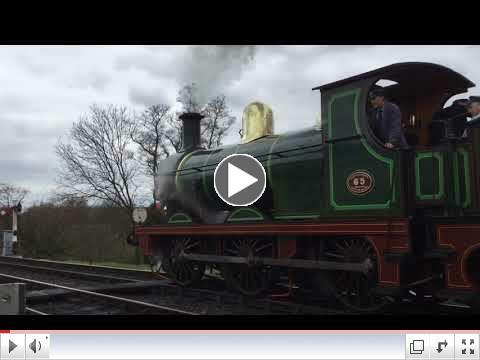 Writes Ian on Heritage Painting's Facebook page : "A special mention should go to the staff and volunteers at the Bluebell Railway after the hard graft they put in to help clean the wheels and frames. It certainly helped my team complete their work and they've thoroughly enjoyed working with our friends at the Railway." From No. 75027's webpage : No. 75027 was ordered under the 1952 build programme as one of a batch of locomotives comprising nos. 75020-75029. Production of this batch of locomotives (plus numerous others) was delayed due to a national steel shortage, during which the government prioritised steel output towards export products. As a consequence, No. 75027 was not completed until May 1954 at BR Swindon Works as part of Lot No. 400, although the builder's plates show 1953 as the build date. It was coupled to a type BR2 small tender and would have been outshopped in BR lined black livery with an early BR crest on the tender. No. 5768 Update: End in Sight? A first class compartment, showing reupholstered seating and re-chromed fittings (all photos by John Fry). Roger Williams sums up current progress as "painting and bogies are progressing slowly but the end of the fit out is in sight'. Seventy one years after its construction, and 50 years after its purchase by the Bulleid Society, the coach is on the verge of the completion of its most comprehensive overhaul in preservation. Twelve re-upholstered First Class seat cushions have been returned; photographs show the interior of a first class compartment, luxurious in comparison with the third class further along the corridor. Re-chroming of items such as heater controls, lamps, and luggage racks lend style and class to Bulleid's design for the six passengers in the first class environment, where Bulleid intended, and succeeded, to give the passengers as much comfort and spaciousness as possible. The third class passenger had a lower level of luxury with a greater passenger capacity in each compartment, but there was still the upper class chrome fittings, as can be seen in the photograph. Painting continues on the exterior, and work is progressing on the overhaul of the first of the two bogies, as shown in the bottom right photograph. Third class seating, with no arm rests. One of one of the bogies being overhauled. In anticipation of Branch Line Weekend, Tony Hillman presents six John J. Smith GWR Branch Line images. No. 1470 with the 1400 at Culmstock, looking west towards Tiverton Junction. Taken on 30 June, 1962. Applications are invited for the post of Buildings Manager for the Bluebell Railway. The successful applicant will be responsible for the inspection, repair, and maintenance of the company's buildings. Building management, architectural, design, surveying, construction, or similar qualifications and/or experience are necessary to effectively undertake this role. This is a volunteer post that carries no remuneration or specific hours of duty. However, the successful applicant will require sufficient time and flexibility to effectively undertake this role and have the appropriate technical competences to meet the professional requirements of the post. If you believe you have the right qualifications and experience for this job please send your CV to lisa.boyle@bluebell-railway.co.uk or call 01825 724884. We have been extremely busy during the past few months, and it's time to bring you up-to-date on some of the developments regarding the restoration of 4 Vep No. 3417 "Gordon Pettitt". After discussions involving the Senior Minions and Mr. Pettitt himself over the last month, we have decided that the restoration project deserves a name: we have christened it "Project Phoenix". In order to make the project manageable, and in order to allow us to bring the unit back to a "paying basis", the project will be conducted in phases. This phasing of work will allow us to make the best use of our current finances and to aim our small technical team at specific goals. We will be setting up an additional page on the website in due course to give you further details on the scale of work for each phase. We have all agreed that the ultimate goal remains mainline running, we want the public to experience the particular rush and hurry that comes when riding a Mark One Electric Multiple Unit at line speed. No other EMU preservation group is in a position to deliver on that promise; we intend to ... MORE . John Sandys (26 April, 2018): "On a typical April showery day, the Q class was in action together with the Observation Car to the rear of the train running to a Service One timetable." 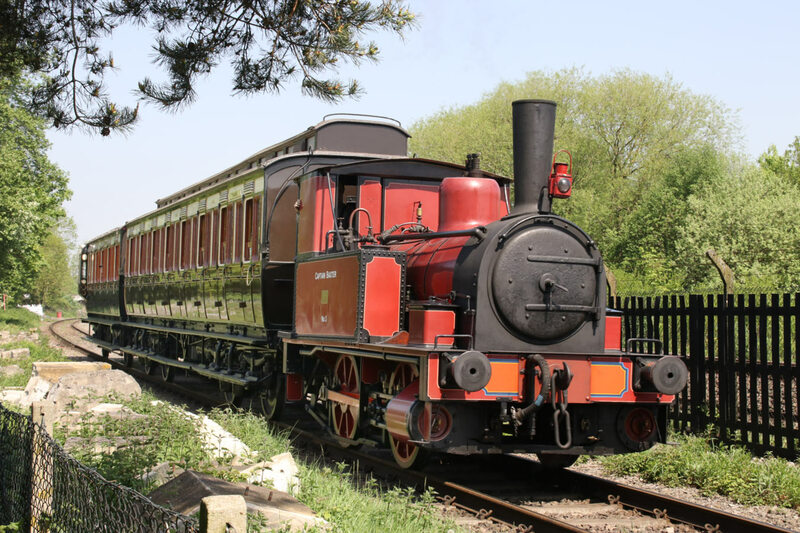 Brian Lacey's photo shows the Maunsell Q class at West Hoathly on 1 May, 2018. Robert Else's photo shows No. 3 "Captain Baxter" on loan at Didcot, hauling a pair of Dean-designed GWR carriages on one of the demonstration lines on 5-6 May, 2018. You may have read about the new General Data Protection Regulations (GDPR). The Bluebell Railway believes, after careful assessment, that the Railway has a legitimate interest in publishing this eNewsletter. 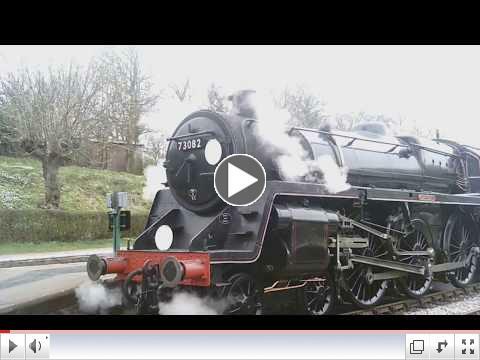 The eNewsletter covers relevant information and news about the Railway. It is not related to any external providers' products or services, and through our vendor Constant Contact, there is a safe unsubscribe facility. The Railway will therefore not ask existing recipients to sign up again for the eNewsletter. If at any time you no longer wish to receive it, please use the unsubscribe facility at the bottom of the newsletter. If you unsubscribe, only you can re-subscribe. Didcot Railway Center posted this photo of "Baxter" visiting the center on 5 May, 2018. "Baxter" is pictured with four-wheel brake third No. 416 (1891) and clerestory third No. 1941 (1901). Photo by Kevin Dare. The Railway on 15 April, 2018, by "transporting south east". The Railway is seeking bar and restaurant staff and silver service wait staff. Casual shift work for mid-week and weekends and seasonal contracts available, with various hours to suit. Apply to Catering Manager Simon Barker at simon.barker@bluebell-railway.co.uk or 01825 724881. The locomotive duty roster for May 2018. A very hot day at West Hoathly and Horsted Keynes, on 7 May, 2018, by Andy Collett. Footage of people attending diesel engineering school in Derby in 1956. The updated component sponsorship list for the Brighton Atlantic project, including flue tubes, a blower steam valve, oil trays, flue ends, and more. A 4- or 6-wheeled truck used in pairs under long-bodied railway vehicles. The bogie has a central pivot point that allows it to turn as the track curves and thus guide the vehicle into the curve. In the US, a bogie is referred to as a truck. The Railway on 28 April, 2018, by Ben Jensen. New technical job vacancies at the Railway include an apprentice position in the Locomotive Works and a Mechanical Fitter to work on Pullman Car 54. The Golden Arrow on 6 May, 2018, by "Fin Constable". The Christmas 2018 Golden Arrow dates have been set. Evening dining services will run on 1, 8, 14-15, 19-23 Dec., 2018. Visit the Golden Arrow Facebook page for more.